NYC-ARECS is a Federal Emergency Management Agency (FEMA) National Preparedness Coalition partner, whose objective in the month of September is to help prepare the general public for emergencies and disasters of all types. The Coalition grew out of the tragic events of 9/11, an event in which NYC-ARECS members played a key role in assisting New York City during and after the attack. This year's Coalition campaign focuses on the theme: Pledge to Prepare. FEMA has urged communities around the country to pledge to better prepare themselves for disasters. 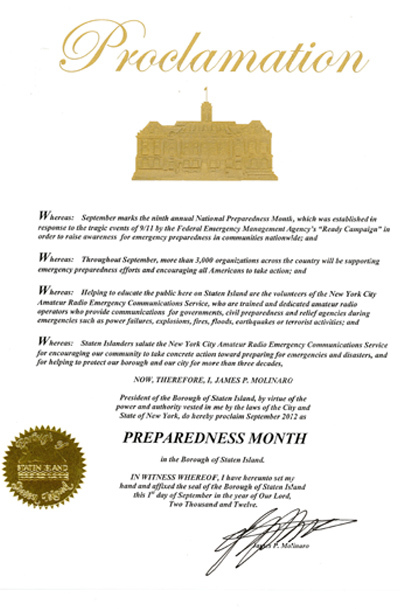 In keeping with this, NYC-ARECS has sought the assistance of both the Brooklyn and Staten Island Borough Presidents, who have respectively offered proclamations in their boroughs, which help NYC-ARECS spread the words about Preparedness Month in New York City. 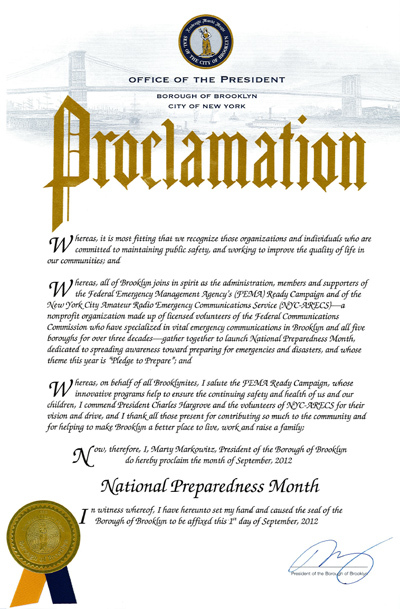 These proclamations, along with the distribution (at public events) of both FEMA literature and City of New York Office of Emergency Management "Ready New York" literature on emergency and disaster preparedness -- has been combined with discussing emergency and disaster preparedness to the public. This, contributes to enhancing the safety of New York City residents, and meeting the worthy objectives of the National Preparedness Coalition.